In order to convert a string to integer in VBA, first, we need to check whether the string can be converted. If not it will return a different string. In order to check whether the string is a numerical value, we will use the ISNUMERIC Function. Then we will use Cint to convert the string to an integer. Let’s take a look at the following example. You have a list of values. There are numerical values, numbers formatted as strings, blank cells, and non-numerical strings. 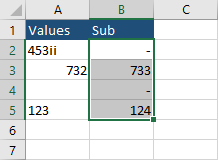 This example shows, in column B how the values are converted. In order to insert function, press Alt + F11. A new window will appear. 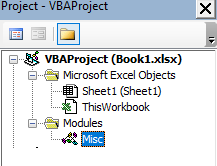 Right-click on the VBA project and insert a new module. Inside this module insert the following function. Now, you can insert this function into an Excel worksheet. 7. If the value is not numeric, convert a string to an integer. 13. The value is returned and displayed inside a cell. This code is a bit different than the last one. This time we will use a Sub, instead of function. It works the way that you select cells you want to convert and execute the code. Insert this code, select cells you want to convert and run the code.